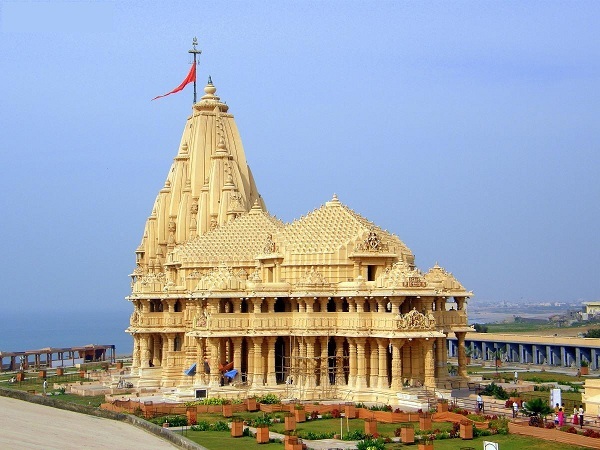 Dwarka, a city in the state of Gujarat is a quintessential place of visit for the Hindus. The city bears the remains of a time when Lord Krishna, himself stayed on this land and turned it into a holy place for ages to come. It is an essential place from the context of pilgrimage and has several places which are considered immensely important. Below are enlisted a total of five places to visit in Dwarka. The place is alternatively known as Bet Shankhodar and has immense historical, cultural, and mythological importance. Apart from being a presidential palace for Lord Krishna and his queens, the place has also served as a port for years, until the development of Okha. 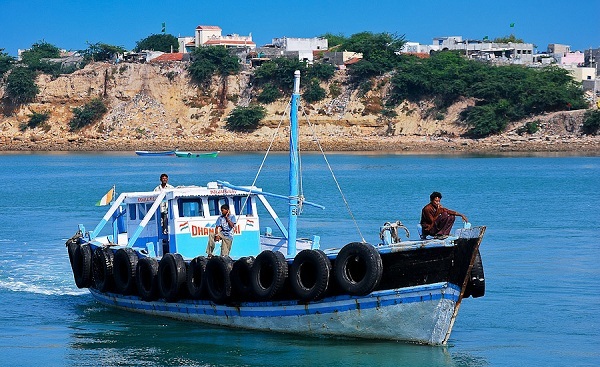 From Okha, one can commute via ferry to Bet Dwarka. The temple is laden with evidences from the yesteryears. There are numerous temples and shrines that speak of a glorious past. The key attraction on the island is the Dwarkadhish Temple. This is not all about the magnificence of the place. It also has the Jain Temples where the Tirthankaras are worshiped. The Vaishnavas also hold the place as a place of utmost importance as it has the seat of the Lord Chaitanya Mahaprabhu. Apart from being a place of pilgrimage, it attracts millions with the availability of water sports and excursions opportunities to the visitors. There is also an active marine life that calls for visitors. It is considered amongst the four major Hindu pilgrimages. The literal translation of the word Dwarkadheesh is, Lord Krishna himself, who ruled over this pious city. The temple is also known by the name of Jagat temple. The structure is decorated with many idols, the main being that of Lord Vishnu. Each day, elaborate worship activities are conducted which also includes bathing and decking up the idol of Lord Krishna. Janmashtami is observed with much pomp and show, thus marking it as the most vital of all festivals here in Dwarkadheesh. According to legends, the holy city of Dwarka was built by Lord Krishna himself at a time which approximately dated back to 5000 years. The city stood on the banks of the river Gomati. The city stood strong and high for almost a century, till the Lord reigned over the place, and when the Lord set his journey onwards for his heavenly abode, the city submerged under the sea. This temple is fondly worshiped as one of the key places of Hindu pilgrimage. The jyotirlinga situated in the temple of Nagnath is worshiped as the Nageshwar Jyotirlinga Temple. This is one of the 12 Jyotirlinga shrines that exist. 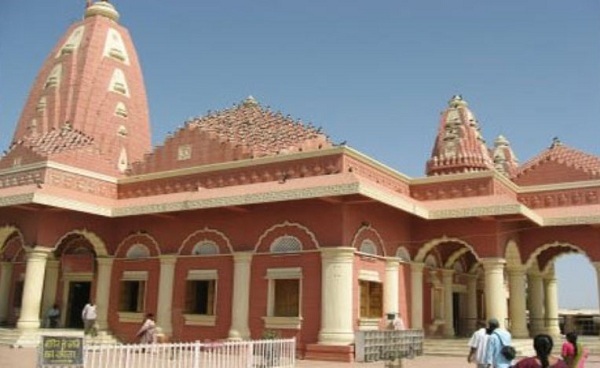 The temple is located in Saurashtra, on the way between Dwarka city and Bet Dwarka. Lord Krishna worshiped the Jyotirlinga. The linga is positioned such that it faces south, and the Gomukh facing east. Namdev, a devotee of the Lord used to sing bhajans in praise of the Lord. The other priests yelled at him and asked him to spare the sides from which the Lord was visible. He then asked the priests to suggest him a suitable side so that the view of the Lord would not be obstructed. The priests then carried him to the south side. Quite amazingly, the linga was found to be facing the south. The shape and texture of the stone of this linga is also quite astonishing and resembles a Rudraksha. This temple is situated on the banks of the Bhagirathi River. 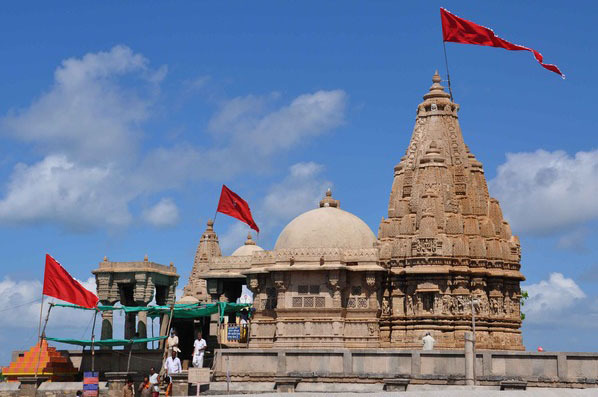 Dwarka Pilgrimage Tour is considered incomplete without a visit to this holy site. The idol is of excellent beauty, and there are four hands of the idol which hold varied items, significant to Hinduism. This four-handed idol symbolizes the reincarnation of Goddess Lakshmi. Rukmini eloped with Lord Krishna in order to marry him. There were none in her family to support her alliance with the Lord. Hence the duo chose the extreme step. However, a great battle ensued between her elder brother and the Lord, in which the Lord was victorious. To celebrate the marriage and victory in the battle, a feast was organized wherein Saint Durvasa was invited. The saint agreed on the condition that Krishna and Rukmini would pull the chariot which would carry the saint, instead of horses or bulls. As the pair pulled the chariot, thirst overpowered Rukmini and thus the Lord hit the ground, such that Bhagirathi River appeared to quench the Queen’s thirst. This angered the saint for he felt insulted as he was not offered to drink first from the river water. He cursed that the land of Dwarka would never have sweet water and Lord Krishna and his Queen Rukmini would be estranged. Thus the Rukmini Temple stands afar from the Dwarkadheesh Temple. Gomti River is one of the sacred Hindu rivers. It is a tributary of the Ganges and originates in the Himalayas. 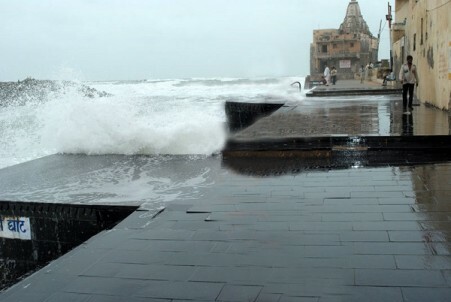 The ghat can be reached from the Swarg Dwar area of the Dwarkadheesh Temple. The river meets the sea and the place is revered as a sacred place. To have a holy bath in the water is considered pivotal for the pilgrims. These are the top five places to visit in the holy land of Dwarka.